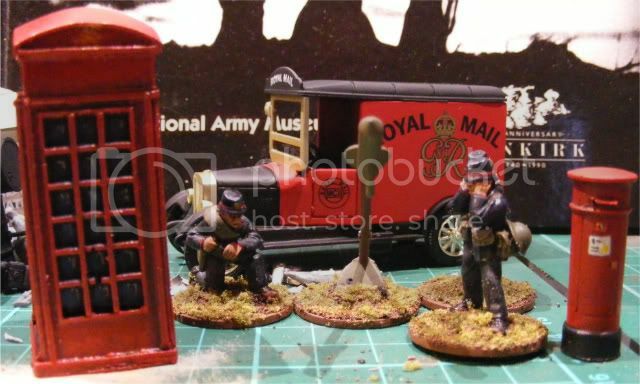 Just finished the Royal Mail Rocket Post team by Musketeer Miniatures and the street furniture from Mutton Chop Miniatures. Well, actually I haven't strictly speaking finished the telephone box. I can't paint letters for toffee so I've got to find my decal paper and make some decals at the weekend. I was of the opinion that the Royal Mail van was a complete steal off Ebay until I realised that it was actually marked with the crest of George VI rather than George V. It's a bit difficult to have something in 1938 VBCW which aligns to George VI . . . . . .